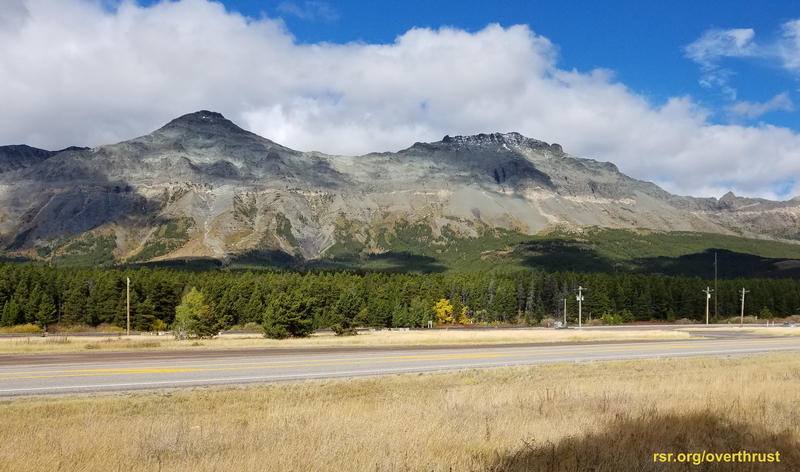 * Debrief of Glacier Geology Field Trip with Walt Brown: Real Science Radio hosts Bob Enyart and Fred Williams discuss the Geological Society of America's 2016 Glacier National Park field trip attended by Dr. Walt Brown, his assistant, geologist Brad Anderson, and RSR's Enyart. The guys discuss three geological features, the Lewis overthrust fault, the 30,000 feet of thin-layered rippled slate, and the "off the scale" flood mud deposits. Bob also talked to the geologists about dinosaur soft tissue, Carbon-14 in diamonds, and rapid opal formation. A thrust nappe consists of rocks that have been pushed several kilometers. The lower boundary of a thrust nappe is defined by a thrust fault. ... A typical thrust nappe rests more or less horizontally on top of a younger sequence of strata. ... What kind of forces were able to push large mountain masses more than a hundred kilometers on top of younger layers? ... Two mountains stand out as the Scandinavian reference sites [Norway/Sweden] of thrust nappes where older types of bedrock lie on top of Cambro-Silurian sedimentary rocks. ... the thrust nappes on the Norwegian side must have been transported at least 100 kilometers relative to the Swedish Cambro-Silurian sequence. ... to many people it seemed physically impossible that such large distance thrust faulting could have taken place. Physically impossible, yes, in a uniformitarian framework, but very understandable, similar to what happened at Glacier, and even the Great Unconformity, as we explain over at rsr.org/origin-of-the-grand-canyon. * Walt Brown's HPT and his Sidebar on Overthrusts: If you're interested, check out Real Science Radio's main Hydroplate Theory page at rsr.org/flood and the sidebar Dr. Brown has written titled Overthrusts: Two Possibilities (click and then search, ctrl-f, on that page for: Morris). * Bob Enyart Stuck on a Glacier -- Really: Via this RSR flashback to almost exactly eight years ago today, you can listen in to Bob sharing his harrowing experience in Alaska back in the 1970s when he and his friends, unwisely, attempted to climb a glacier unprepared.